Meanwhile back at the workbench: Too much trouble with this kit. Will leave it at the shelf for another time. But I want to give you some other russian bird to fill the void. Kit ordered. A very colorful one. Stay tuned! Too bad you're giving up on the Ishak for now, dutik (someone on the sovietwarplanes site is making a type 29, but in 1/72nd scale). I will look forward to your new Soviet aircraft, though. It is just to meet the timeline. A tactical move, to say. Hint: it is an airplane with a M-22 engine. Donor of the engine will be Trumpeters NKL-26 aerosan. Whoa! Got it! Both kits! Well, the engine has more parts than the airplane kit BTW, it is a M-11. Sorry for that "double" typo above. Looks nice. Will give you images and all info in the evening! I want to build an UT-1, or Air-14, advanced trainer, designed by Yakovlev. Sorry for flash, but it is printed on glossy paper. Yep, thats all. 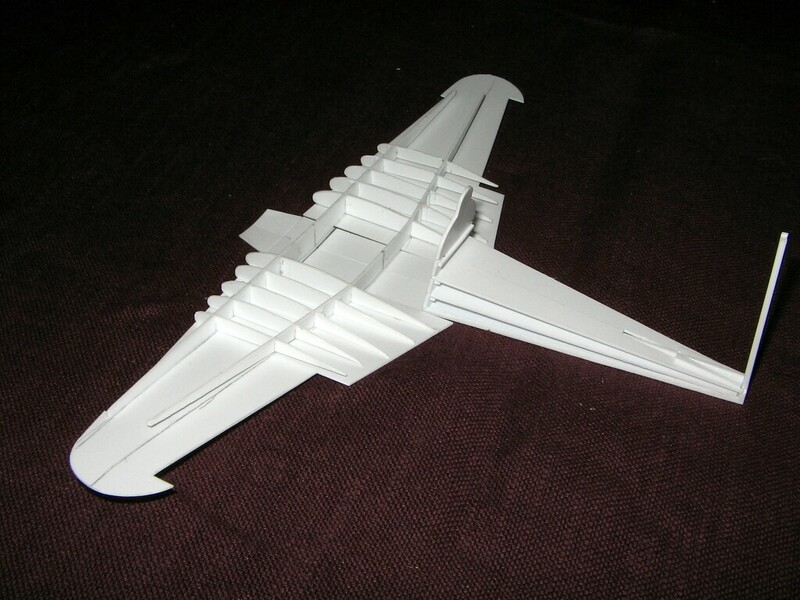 One A3-sized sheed of printed paper, 3 sprues for the engine made by Trumpeter (from the NKL aerosan kit). 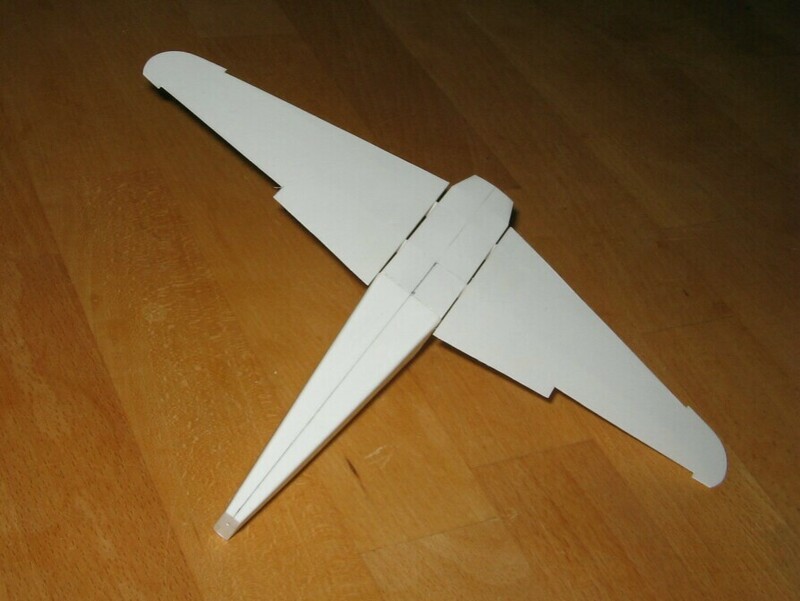 I want to replicate the airplane in plastic sheet. I have mustered my Evergreen resources so far. Will start when I finished my Multi-Wing GB Junkers. p.s. There was another kit in that parcel. Something very russian. Very small. Never made in styrene. Maybe I will make a build devoted to Learstang? 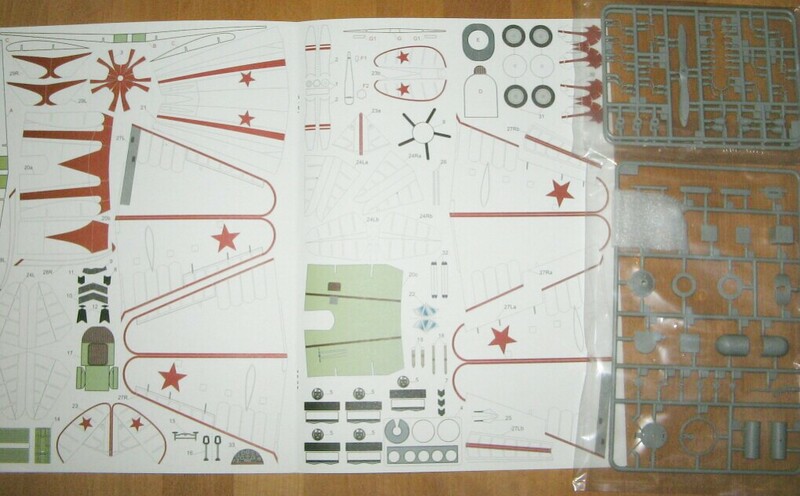 It is a very simple kit. TOO simple, to be correct. There are 2 wingspars, but just one fin for every wing. Not a lot to get a proper shape, not to mention some stiffness. Much worse for the rear fuselage. Behind the rear cockpit wall is nothing provided than the outer shell. There are line drawings at airwar.ru, which provide some useful details like cross sections. So I started to make more fins for the wings (see above) and spars for the fuselage (this is the rear bulkhead with a large spar to get the fuselage rigid enough for handling). Nice choice, dutik! I hope that other small aeroplane you mentioned starts with an "I" and ends with a "153". The devil has told you about! No, the Devil merely hinted what it was. That mythical brown and green camouflage scheme is harder to kill than Count Dracula! Good idea about using parts from the I-16 - no point in scratchbuilding everything. You definitely need to do this model, dutik. If you don't, I'll have to and I don't feel up to it. The right hand fins are misaligned and kinked the spars. I had to cut the outer two off. 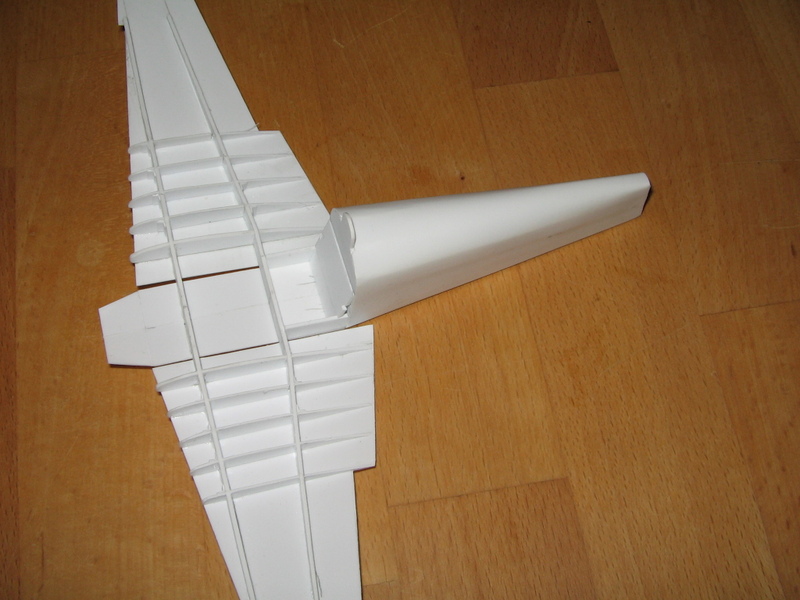 Now I glue the spars and fins one part afther the other onto the lower wing surface (prepared some lines for alignment). My first scratch build. Learning by doing. The rear fuselage is canvas over welded steel tubes. 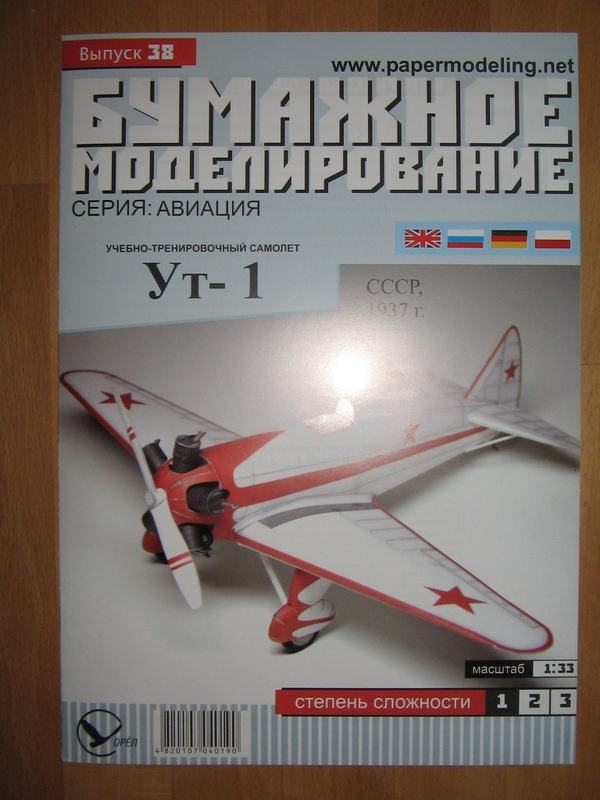 Same construction like the better known Yak-1, Yak-7 and so on. It took me some days to find an solution. I think bulkheads and stringers are to weak to stay in shape when adding the skin, or would be too thick for the desired effect, so I am going with horizontal plates and spacers. Ahead is a weak point: The junktion between for and aft fuselage in front of the bulkhead. There is the open cockpit pit, so it will be difficult to add somewhat substancial stringers to avoid hogging or sagging of the fuselage. The tiny scale stringers are too flimsy to fulfill the task. I think I will form an open topped box with strip styrene along the sidewalls, between rear spar and bulkhead, just the hight of the spar. We shall see. Made some progress following Lenins words: Shag vperjed, dwa shaga nasad (one step forward, two steps back). 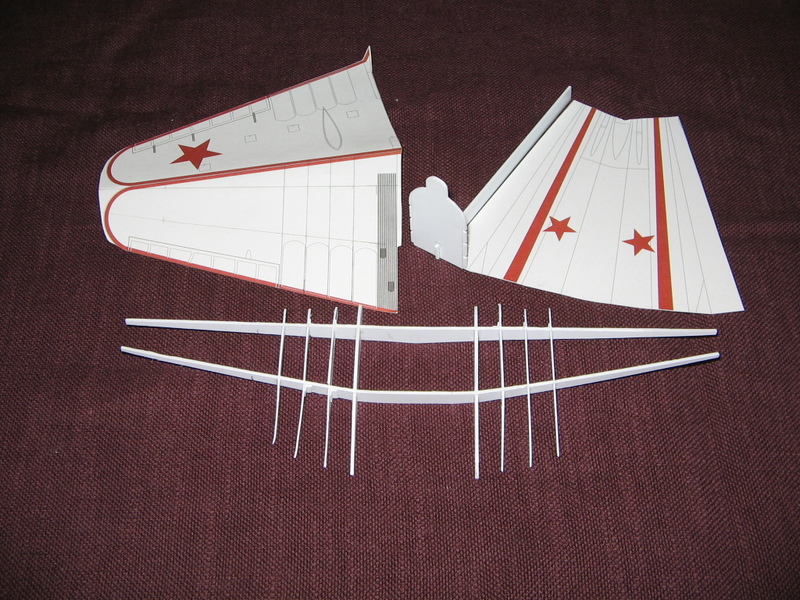 I've added more fins to the rear fuselage and "foiled" it with 0,25 mm sheet plastic. Looked very nice and had that "canvas on frame" effect. At least for 2 hours. Then it cracked. I peeled off the sheet (took me a half night to do so). "No bad waves, man!" to quote another philosoph The taper of the fuselage was not correct (it was too fat at the tail, so to say), so I used the opportunity to sand it down too. Now it is covered again, with 0,5 mm sheet. It was still intact this morning. We shall see. Learning by doing. Some more progress. 0,5 mm sheed did the trick. No nice canvas effects, but also no hint of cracks. Added an open topped "box" at the cockpits rear wall to get a good, straight and strong (as possible) joint between rear fuselage and wing. Also had to cut something off at the trailing edge of the wing. I used the whole paper part to make the cover for the lower wing surface, while in fact it was intended to be curled up at the leading edge. I. e. it was to large and had to be reduced. Well, now it fits mostly the plan view of the russian drawings. I have just to correct the cutout for the ailerons. Also started to build the M-11 engine of the aerosan kit. It is very nice. Made by Trumpeters A-Team, I guess. Ah, that's a real shame dutik. I've been following and admiring your build. Still, it's better that you look after yourself. Take care! Sorry to hear this, dutik! Take care of yourself, man - this is a great hobby, but nothing worth getting injured over. Get well soon!